Vincent Price’s menacing presence and facial hair receive suitably adoring treatment courtesy of Scream Factory’s The Vincent Price Collection, a four-disc, six-film Blu-ray set that houses some of his greatest genre achievements. Overstuffed with extras—including introductions by the actor himself—and boasting fantastic transfers, it’s a box that pays proper respect to the horror icon, whose work was defined not only by an array of beards, goatees, and paper-thin mustaches, but also a creepy, unhinged regality and macabre sense of humor that proved ideal for period-piece sagas of madness. That was most ably on display in Price’s Edgar Allan Poe efforts with director Roger Corman, three of which—The Pit And The Pendulum, The Fall Of The House Of Usher, and The Masque Of The Red Death—are included here. (There’s also The Haunted Palace, which is an H.P. Lovecraft tale that takes its title from a Poe poem.) Price’s imperial authority and poise are right at home within Corman’s gothic cinemascope settings—weathered castles coated in cobwebs and mist, decorated with candelabras and velvet curtains, and marked by iron gates, roaring fireplaces, secret passageways, crusty tombs, and dank dungeons full of chains and torture devices. Corman’s use of lurid, swirling colors and hazy effects turn the films into disorienting nightmares, even when, as in House Of Usher, the material goes a bit torpid. Nonetheless, it’s Price who’s truly responsible for making the collaborations thrive. His sinister smiles and sudden bursts of ruthlessness bolster these tales about possession by ghosts of the past or, in the case of the superlative Masque—a Grand Guignol portrait of plague-years Devil worship—by hubris. Masque marks something of an apex for Price: Unlike his prior Poe characters, his Prince Prospero is a fully formed, evil creature from the outset, and Corman’s staging of his every callous and cruel maneuver (all to pay tribute to his Satanic master) has a grim comedic deliriousness, culminating in a final masked gala attended by the Seventh Seal-inspired Red Death himself. Costume parties also factor into Price’s 1971 The Abominable Dr. Phibes, a masterpiece of the genre despite some uncomfortable undercurrents of anti-Semitism. (The film’s visual majesty and wit is especially bracing when compared to the aesthetic crudeness of 1968’s Witchfinder General, in which Price goes through the motions during his scant screen time as a witch-burning true believer.) Opening unforgettably with a black-robed figure flamboyantly playing a blood-red organ as a band of robotic mannequin puppets deliver musical accompaniment, Robert Fuest’s Phibes is a film of inspired hallucinatory horror, even as it juxtaposes its scares with comedic bits involving bumbling Scotland Yard detectives. As a resurrected fiend with a waxy complexion who speaks through a cable plugged into his neck, Price never moves his mouth, but expresses lunatic psychosis through silent expression. 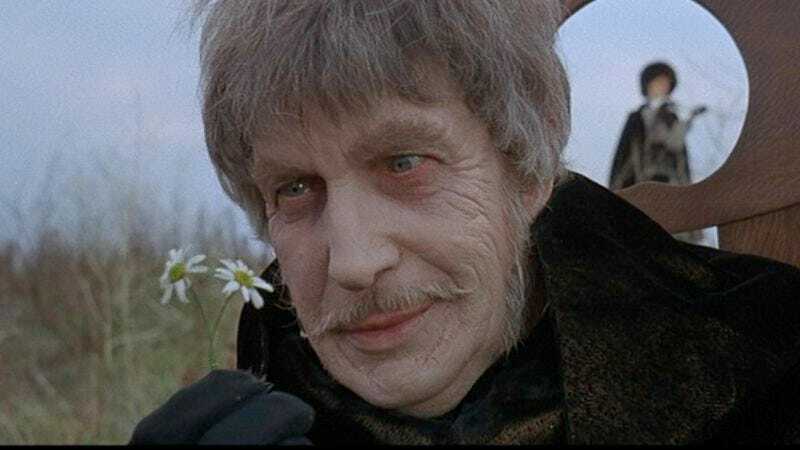 Consumed by his desire for vengeance against the doctors he blames for his wife’s death, Phibes carries out murders in accordance with the 10 biblical plagues—a modus operandi of epic ambition, worthy of Price’s own legendary career as cinema’s grand maestro of malevolence.